Mark Moseley, Robert Clephane and Alan Bonnici fished at the local Melton reservoir. 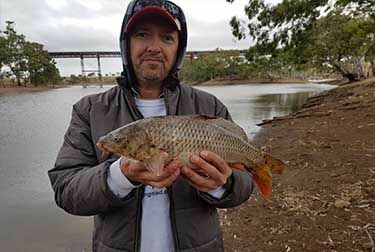 The guys caught many small redin on a range of soft plastics like z-man grubs, hard body lures such as bullet 5 inch pink tiger, 3 inch Christmas beetle, ecogear SX40f and vibes such as the Berkley Big eye blade. They also caught many small redfin using scrub worms as bait. Mark caught a medium size Carp on Corn, and Alan watched on helplessly as a big fish took his rod out of the rod holder, down the rocks and deep into the reservoir. A new fishing combo gone in the blink of an eye. Hopefully we will find the big redfin next time.